One thing we can’t get enough of is reading running blogs. Especially when they’re written by local runners! 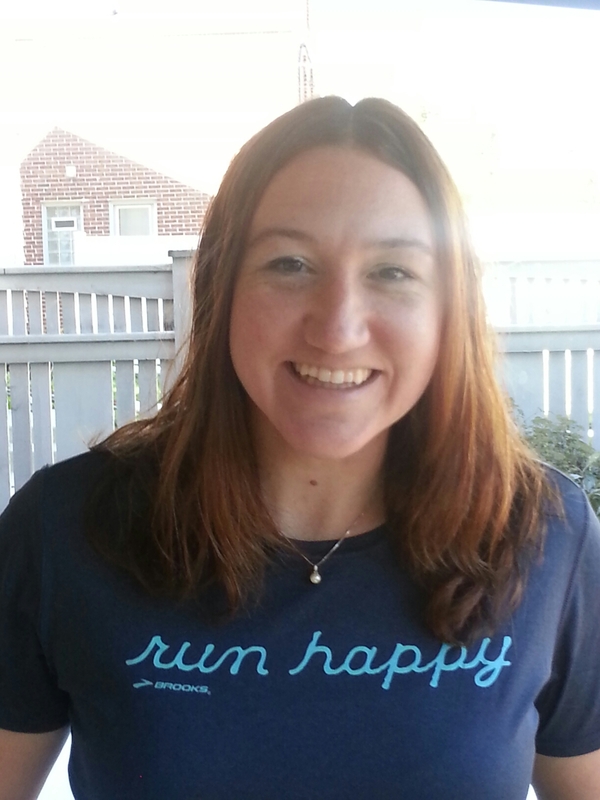 Amy Barrett-Jacobs, author of 1 Unlikely Runner, uses her blog to share her story and motivate everyday runners to achieve their goals at their own pace. ” If the race is fun and you enjoy the journey, it shouldn’t matter where you are at the end,” she says. Right on, Amy! Read on to learn more about how she got started with running and what motivates her to keep going with the sport. Favorite workout: I love running to the track near my house to do some speed laps and finishing with a cool down run on the way home. I’ve also begun falling in love with tempo runs – I had never been diligent about those before. Favorite distance to race: That’s a tough one – I love 10ks because it gives me a chance to use some speed, but I also love half marathons because it takes discipline to train for them, and they give me time to stretch my legs and really challenge myself. Favorite song to get pumped up pre-race: Bruce Springsteen’s, “Born to Run” or “Born in the USA” – I know, cheesy right? Favorite post-race treat: It’s crazy but I love having a cinnamon dolce latte from Starbucks after a race, or if we go for a post-race lunch, I love BLTs with avocado and sweet potato fries. Must-have gear: My Pro Compression calf sleeves for sure – they’re great for long races and awesome for recovery. I started running because my brother did. He’s older than I am and when he was in high school, he ran cross country and track. I began running track in 7th grade and have never looked back. I started running because I wanted to be like my brother – I never expected to love it as much as I do. 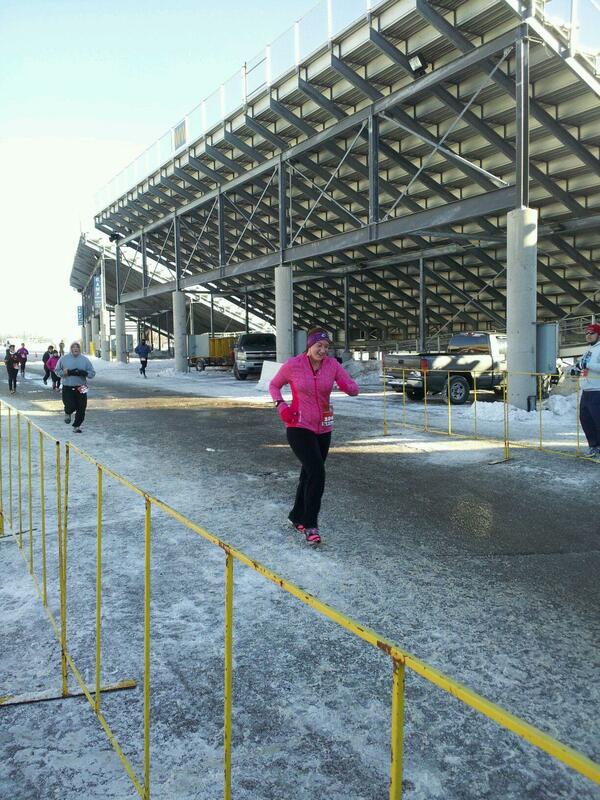 Running has always been my outlet. Even after high school when I was burnt out on running and had nothing to train for, whenever I was sad or frustrated or needed to burn off some energy, I’d go for a run. I love to pound the pavement and leave everything out there for the next rain to wash away. Running as an adult has opened me up to so many new possibilities – I’ve met some close friends through running and my blog, and I love the camaraderie within the running community. A typical training week has me running Monday through Thursday with Friday being a rest day and Saturday being a long run day. On Sundays, if I don’t have a race, I will try to at least do a short run or a long walk. I also try to incorporate abs and strength a couple times a week and do shorter runs those days. Every once in a while, I also do circuit training, yoga and step classes at work. I’m not strict with my schedule, though – I don’t want to burn myself out. Running is fun for me and I want to keep it that way. You consider yourself an ‘Unlikely Runner’ – Can you tell us a bit about what this means and why you consider yourself an ‘Unlikely Runner’? I love this question! I am self-titled “1 unlikely runner” because in my mind, I am the exact opposite of the runner stereotype… and because more often than not, I hear “well, you don’t look like a runner.” I’m really tall, I doubt anyone would call me skinny, and my form would more likely be compared to a T-Rex than a runner. I don’t count calories or read package labels as much as I should. I don’t fuel all of my runs with Gu and ShotBlocks. 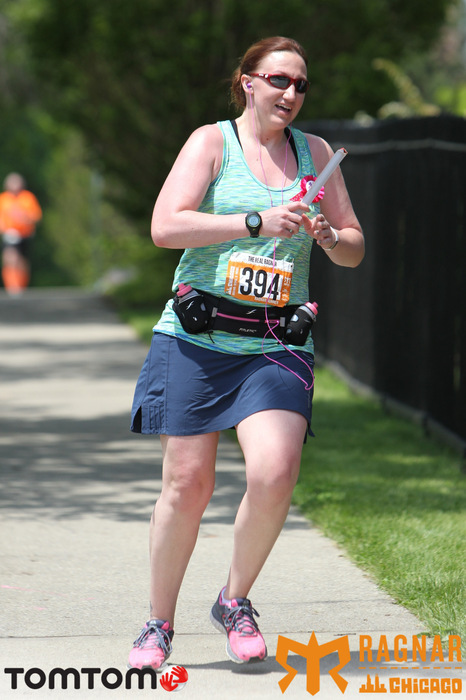 My three biggest PRs (5k – 27:27; 10k – 58:08; ½ marathon – 2:27:43) came after I had beef jerky for breakfast. My husband thinks this is a coincidence – me, not so much. Let’s chat a bit about your blog. What topics do you focus on and why do you think your story resonates with the everyday runner? While I started my blog, 1 Unlikely Runner, as a ‘running blog’, I feel like I’ve let it evolve into so much more. I don’t believe that simply focusing on one topic gives readers the full picture of who I am and what I’m all about. While I often do product reviews, I don’t review anything that I don’t truly enjoy or that I don’t use on a daily or weekly basis. I truly believe that my story is applicable to the everyday runner because too often I hear people say, “I could never run that far.” I thought the same thing in October 2012 when the longest I’d ever run was 6.5 miles. The point I try to make in my blog is that it’s not about being first or last – it’s about trying. So what if you finish last? At least you finished – at least you tried, and if the race is fun and you enjoy the journey, it shouldn’t matter where you are at the end. What’s motivated you to keep running? Honestly, it’s the feeling I get on a really good run. It doesn’t happen every day, maybe not even every week, but that once-in-a while feeling is what keeps me coming back. Also, the rapport during a race – people you don’t even know encouraging you – it’s an amazing feeling. I heard a quote once, “If you ever begin to lose faith in the human race, go out and watch a marathon.” I love it. I really love running around the streets near my house in South Milwaukee because it’s so residential and it’s awesome people watching! However, I also really enjoy running through Lake Park and South Shore Park because the views are incredible, especially during the fall. 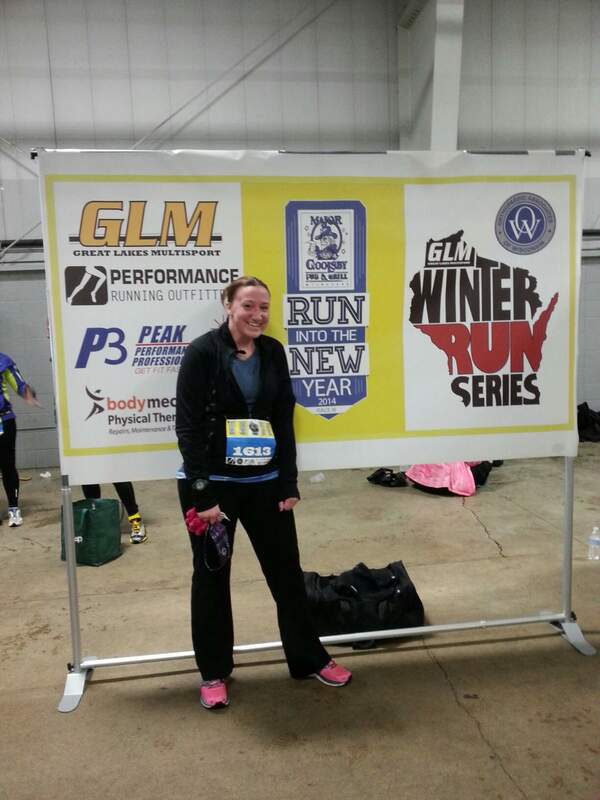 I loved the Great Lakes Running Series this past winter as it kept me training during the polar vortex. I love the Race for the Cure because it’s a really good cause that it is dear to my heart. I recently ran the Bacon Race 5k with a friend, which was a blast! 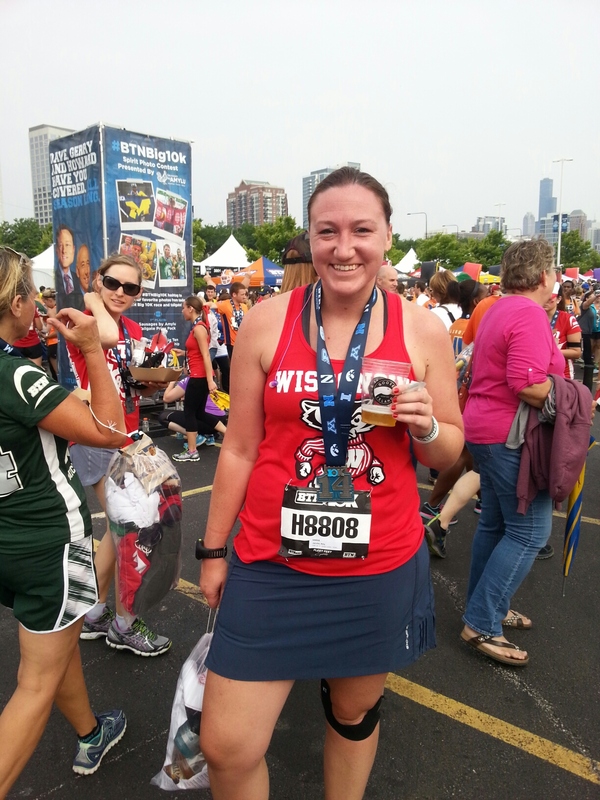 I’m a member of Badgerland Striders and being a part of that has really opened my eyes to a lot of new races, such as the Lakefront Discovery 15k, and I’m really pumped to run Lakefront Marathon in October (my first full). I volunteered at that one last year and I’d never before seen so much energy and amazing camaraderie in one place. I’m currently in training for the Lakefront Marathon. I’ve never done a full before and it’s a huge goal – I would really just like to finish. I would also like to break 2:15 in a half marathon – I finally broke 2:30 at the Wisconsin half in May and would love to knock down that next wall before the end of the year. This entry was posted in MKE Runners and tagged Amy Barrett-Jacobs, MKE Runners, Running in MKE. Bookmark the permalink. Beef jerky for breakfast, sounds delicious! I’m totally trying that one!